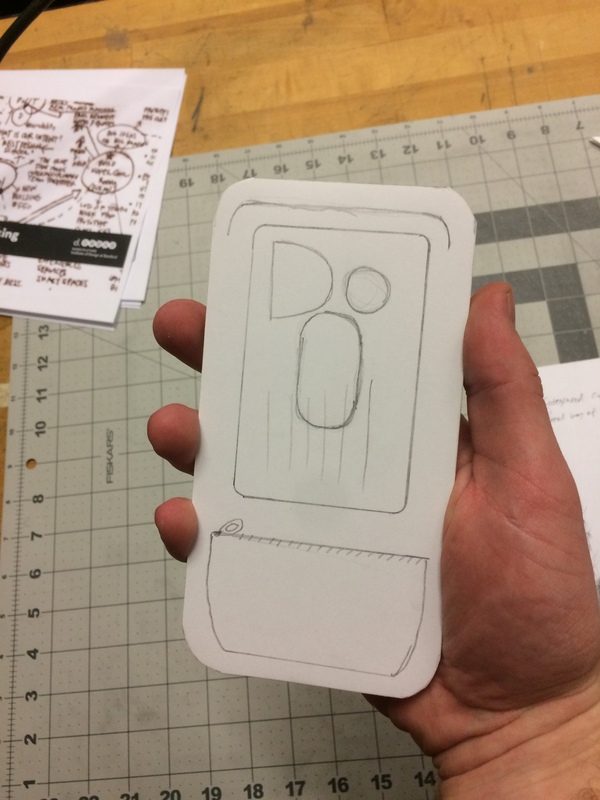 Initial Ideation Sketches: Concepts explore different ways to organize a physical wallet, as well as ways to change how payment is made. Concept 2: Sensor embedded within wallet allows card reader to detect different cards “loaded” into wallet. Payment method is selected on card reader. 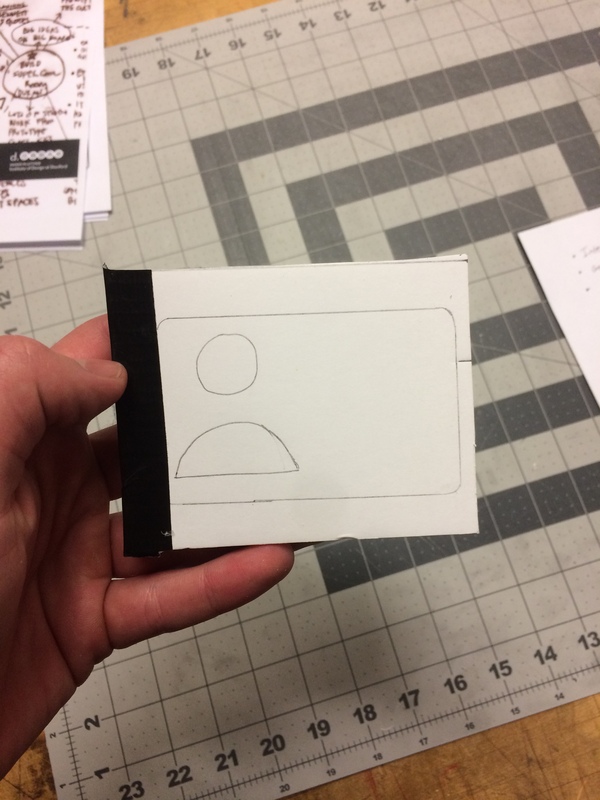 Concept 3: Circular disc consolidates 6+ cards into a single object. User spins through to select chip, which is then put into machine. 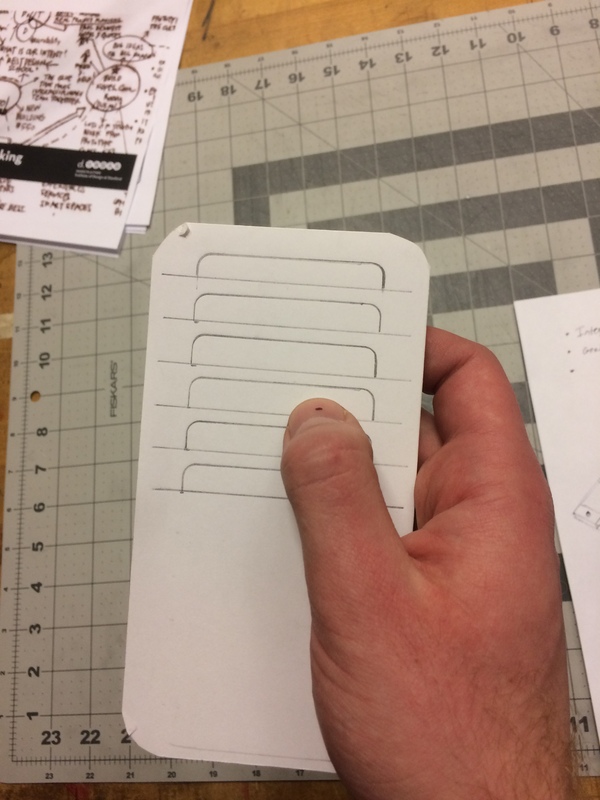 For this assignment, we met up in Burchard hall to build some quick prototypes to help generate/analyze ideas. For this design, we wanted to have something to accommodate people who like to pay with cash and change, as opposed to using a credit or debit card. The front of wallet contains a transparent sleeve to hold an ID so that users do not need to open their wallet when they need to show their ID. The back of the wallet has four elastic pouches to hold quarters, dimes, nickels, and pennies. The idea of having the pouches be elastic would allow for the wallet to still be slim despite having the coins on the outside of the wallet. 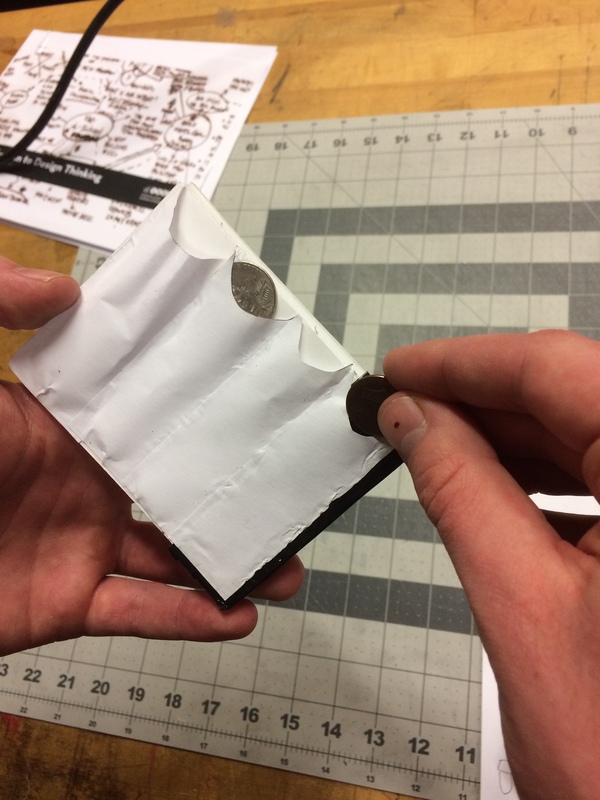 The elastic pouches would be tight enough so that the coins would not fall out if the wallet was held upside down. However, it wouldn’t be so tight that the user would have trouble trying to get a coin out. The idea of this wallet is for it to be integrated with a smartphone to make it more dynamic and convenient for the user. The user can use an app within the phone to choose between any type of credit, debit, or gift card that he or she wants to use. 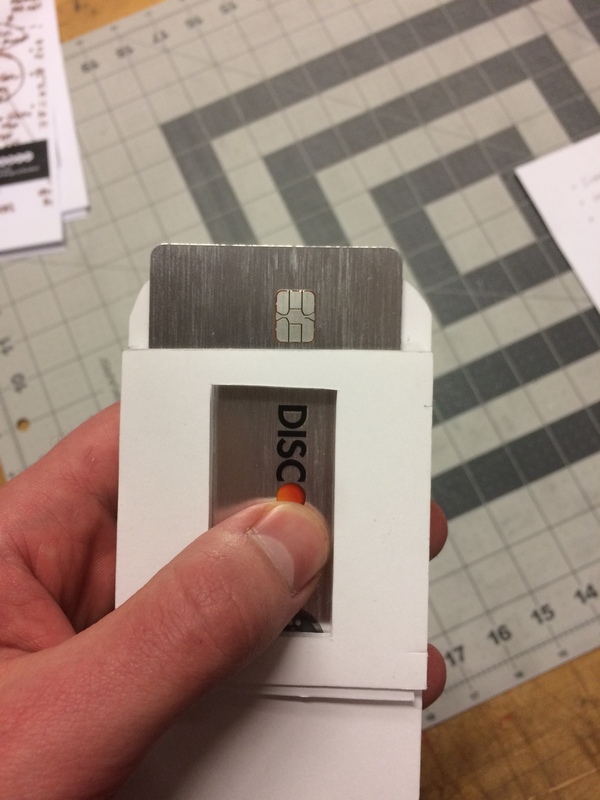 The physical card attachment to the back of the phone would represent the selected card from the app. The attachment would use NFC technology to wirelessly pay and RFID for Chip payments. 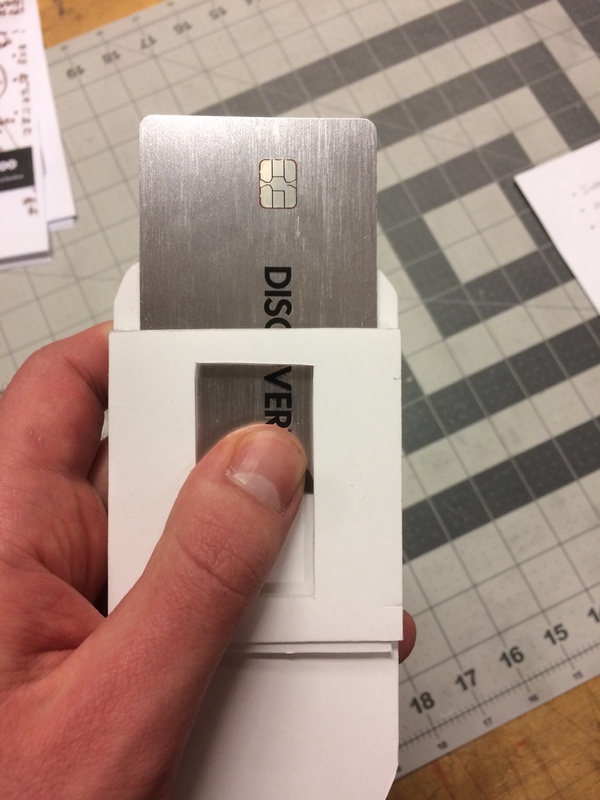 A barcode will also be displayed on the card attachment for when RFID or NFC technology may not be available at a consumer location, so the user can use a barcode scanner. The card-like extension would slide out easily when the user slides a smooth mechanism on the back of the phone. The design of this wallet allows it to be sleek and thin, since there are no folding parts. The front of the wallet contains a transparent screen so that the user’s ID can easily be shown to others when needed. There is also a zippered pouch on the front so that the user may store any change if they need to, but it is compact when not in use. The back has numerous compartments for any cards that the user needs to carry. Since the wallet is longer and thinner, cash bills don’t need to be folded, but can be placed in unaltered. 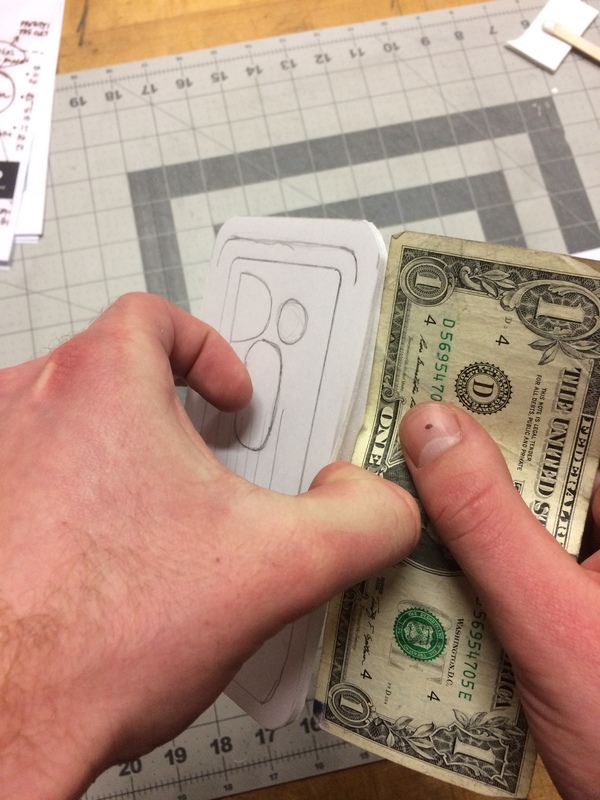 By not folding the dollar bills, the thickness of a wallet is greatly reduced. I found it interesting in the first reading by Sengers that she believes because engineers follow a Taylor-like way of solving problems, they are not having fun with the work that they do. I don’t completely agree that engineers follow that mindset all the time, but from a personal perspective, when I do follow that strategy, I enjoy it. I like following a routine of doing certain procedures to follow a problem. In the other text by Blythe, I do like how he mentions how people should design to appeal to the different senses of experience. I think what Blythe mentions is important to take into consideration when designing a system.